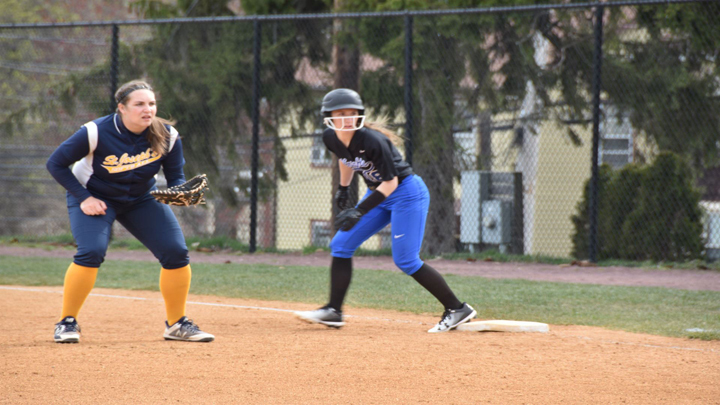 The Mount Saint Mary College Softball team opened Skyline Conference play in strong fashion on Sunday, posting 14-2 and 20-3 wins on the road at Yeshiva. BRONX – The Mount Saint Mary College Softball team opened Skyline Conference play in strong fashion on Sunday, posting 14-2 and 20-3 wins on the road at Yeshiva. The Knights combined for 34 runs on 25 hits against the Maccabees, with Emily Lang and Lauren Oury totaling five hits apiece over the two games. The Knights got off to a fast start in the opener on Sunday, plating six runs in their first at-bat of the day. The Mount strung together four hits and took advantage of two errors and a pair of walks to get all the scoring it would need in the game. Freshman MacKenzie Hymes blasted a grand slam in the inning to key the opening rally. After Yeshiva got two runs back in the home half of the first, the Mount put the game away with three tallies in the third, two more in the fourth and the final three runs in the top of the fifth. The Knights needed just four hits over their final three at-bats to plate eight runs. Freshman Julia Rigney produced a two-run single in the fifth to finish off the scoring in the game. Mount Saint Mary outhit the Maccabees 8-4 in the opener with Lang, Amanda Almodovar, and Oury each finishing with two hits. Oury doubled in the game for the Mount and scored twice, with Almodovar, Nicolette Moustouka, Hernandez and Lang all crossing with two runs scored. Sophomore Morgan O’Neill picked up the win in the circle with a complete game effort for the Knights. She worked 5.0 innings and allowed just one earned run while striking out six in improving to 1-2 on the season. The Knights put game two away early, scoring all 20 runs in their first four at-bats. The Knights plated nine runs on just three hits in their first at-bat in game two, with Almodovar breaking the game open with a two-run triple in her second at-bat of the first frame. Rigney, Lang and Oury produced run scoring hits in a six run second inning, before Hymes highlighted a three run third with a two-run single. The Mount finished off the scoring in the fourth with two more runs, with Lang and Erin McCann knocking in runs with two outs in the inning. Mount Saint Mary pounded out 17 hits in game two and featured 11 different players with a hit. Lang finished off a big day 3-for-3 at the plate with three runs and four RBI, with Oury also going 3-for-3 with two runs and a pair driven in. Almodovar drove in two runs and scored four times with Moustouka and Victoria Santomauro scoring two and three runs, respectively. Hymes picked up the win in the circle for the Mount and moved to 2-5 on the season. She allowed two earned runs on six hits, striking out four and walking two. Winners of three of their last four games, Sunday’s sweep pushes Mount Saint Mary to 3-9 overall on the season and to 2-0 in Skyline Conference play. Next up for the Knights is a conference home set against St. Joseph’s-Brooklyn on March 30. First pitch with the Bears is scheduled for 12:00 p.m.